University of Bristol researchers have discovered a method to re-use a common plastic to break down destructive dyes found in wastewater. 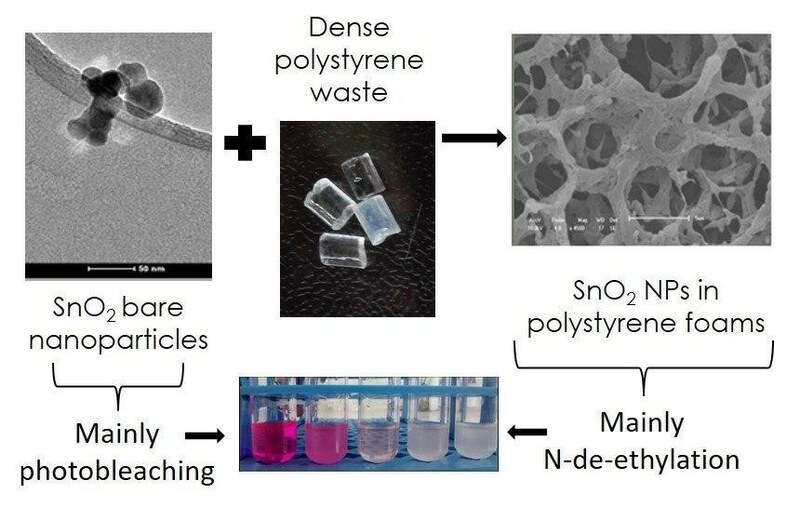 The research paper published in ACS Applied Materials and Interfaces by a joint UK and Brazilian research team describes how artificial dyes, used in the clothing industry globally, could be treated by the plastic found in cutlery and packaging– polystyrene. A smart new material is created from polystyrene by the novel technique of freezing and expanding to a state where it can sustain nanoparticles. In a solid state, it can then be used to eliminate destructive synthetic dyes, which are recognized as carcinogenic and act as chronic reproductive toxins in animals and humans. Contaminants, for instance, dyes can be broken down by active oxidation processes (AOP), which mostly involve a heterogeneous (solid-state) photocatalyst so as to convert pollutants into less destructive end products, such as carbon dioxide and water. In this recent study, waste plastic (poly(styrene)) is re-used to form a porous solid, by freezing it in a solution with cyclohexane as a solvent having a freezing point of +6 °C. Once the solvent is taken away, the material left behind is an expanded solid plastic poly(styrene) foam. This high-surface area support material can subsequently be coated with photocatalytic nanoparticles, forming a solid-state photocatalyst that can be added into contaminated wastewater samples to break down dyes such as Rhodamine B. This dye is banned in food production but is extensively used in sewage treatment plants to detect leaks.